Let the deep color of a garnet become your new favorite hue with this Apples of Gold ring. The rich red of this garnet is powerful and graceful all in one, and acts as an excellent centerpiece for this vintage-style ring. The piece shows off a silver band that is covered in vintage-chic style with open-air patterns and delicate milgrain lines. 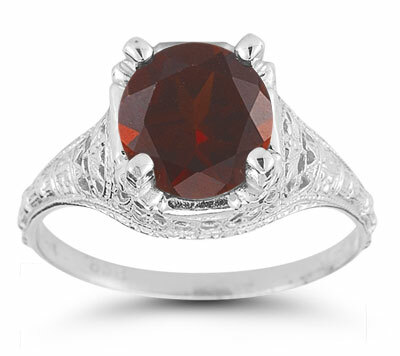 A four-prong setting of silver keeps the lovely garnet stone safely in place while still looking stylish. We guarantee our Antique-Style Floral Garnet Ring in Sterling Silver to be high quality, authentic jewelry, as described above.